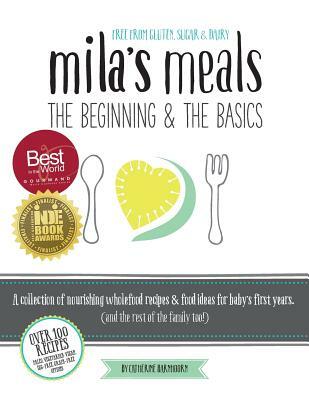 Mila's Meals: The Beginning & The Basics is an award-winning 500-page collection of over 100 gluten-free, sugar-free and dairy-free wholefood recipes and food ideas for baby's first years (and the rest of the family too). Part cookbook, part nutrition encyclopedia, part journal of the author's journey into motherhood, Mila's Meals is a call to action for every parent to be conscious of what they are feeding their little ones, providing a guideline on how to go about this as effectively, effortlessly and joyfully as possible. It is as much about learning how and what to feed your little one, as it is about RE-learning how to feed yourself. The why, what and how to begin your little one's life-long relationship with food. An expose of what is really in that convenient, ready-made food and the affect it has on your child physically, mentally and emotionally. The importance and maintenance of gut health. Reasons to avoid gluten, dairy and sugar. Essential nutrients, the role they play, and where to find them. A detailed glossary for all 156 ingredients used in the book. Over 100 (mostly) uncomplicated recipes made with easy-to-find ingredients. A re-introduction of essential traditional foods & food preparation techniques (like sauerkraut, slow-cooked bone broths as well as how and why to soak grains). 'Do-able' meals for working parents - all the food can be made in bulk and frozen. Catherine is Mom to Mila and a Certified Integrative Nutrition Health Coach. health - which will hopefully stand them in good stead for years to come. immensely helpful and beneficial guidance, for us as parents! exploring and understanding the 'why'. parents who want to give their children the best start to life." wisdom into this beautiful book. information and tips, plus one hundred recipes. Thephotography is delightful. This is an excellent book."